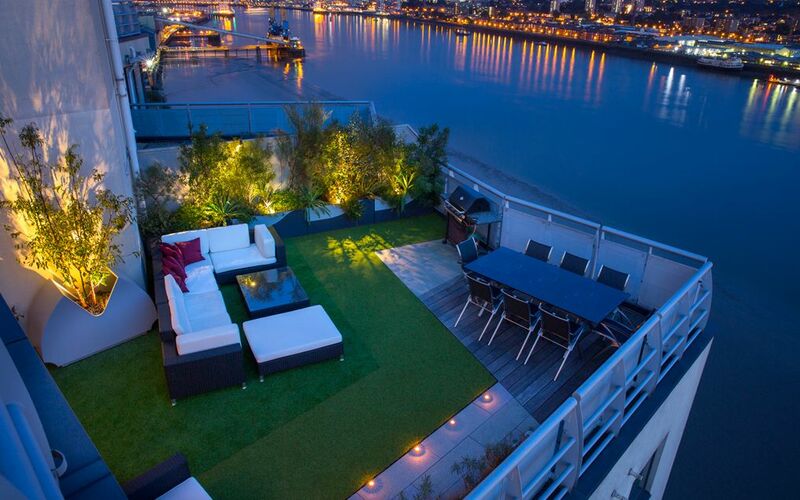 This expansive penthouse roof terrace is part of three multilayered outdoor spaces, presenting panoramic city views high up above River Thames. 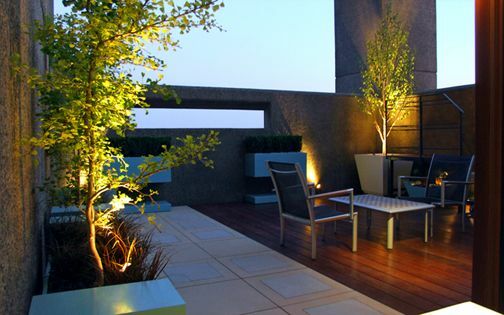 The apartment's rooftop terraces are interwoven into their elevation's outline, and share similar blueprints to enhance fluidity with the building's angularity. 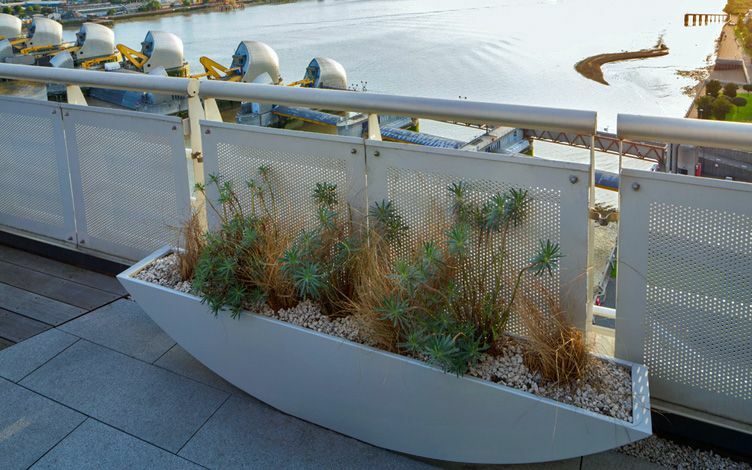 Our surface design reproduces textures in nearby Thames Barrier Park by utilising artificial grass, granite and wood, while bespoke planters reiterate the Barrier piers' silhouettes, amid a cinematic, bustling river setting beside London City Airport. 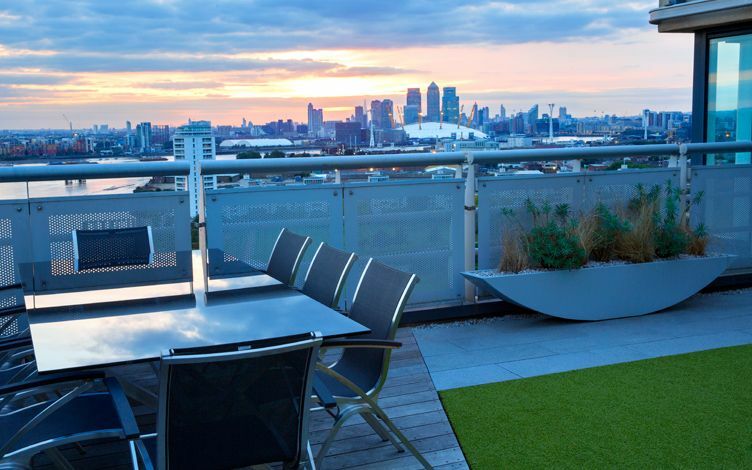 This 16th floor penthouse apartment in Wards Wharf Approach near London City Airport features two terraces. 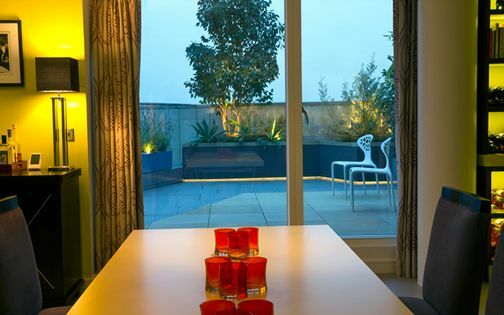 An upper 33-square-metre rooftop adjoins the master bedroom, while the principal 53-square-metre roof terrace lies adjacent to the living room below. 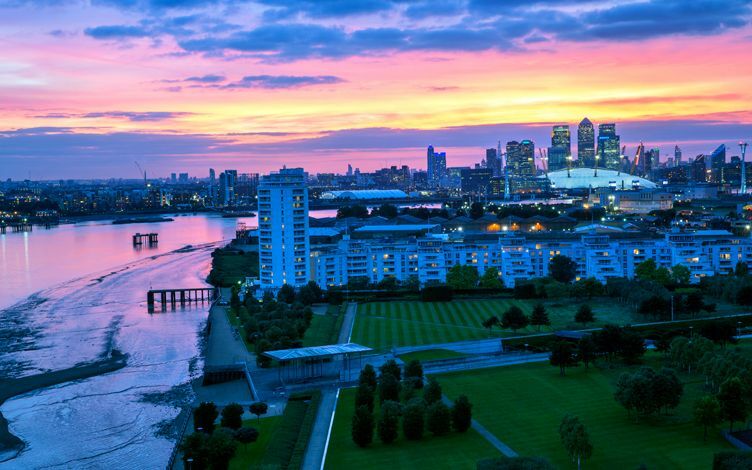 The vista westwards encompasses a myriad of London landmarks, from The O2 to Emirates Air Line and Canary Wharf, while Thames Barrier, with its glistening curved cladding, encapsulates the site's urban sense of place. 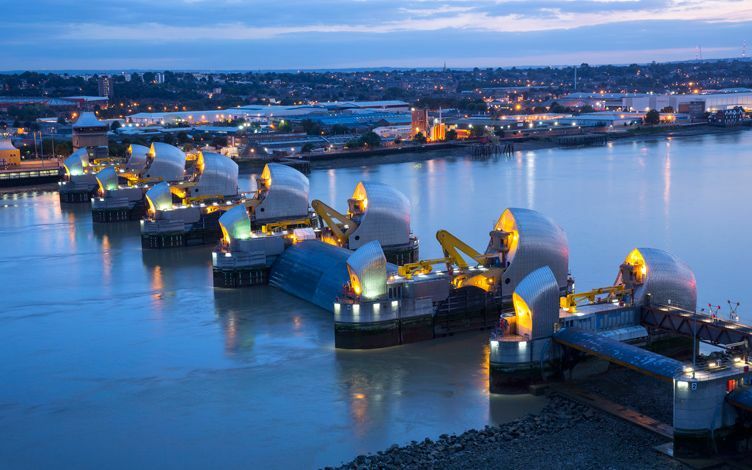 Thames Barrier Park, designed in 1995 by French landscape architect Allain Provost, continues to crystallise a well-integrated, significant East London regeneration milieu, defining its locality's ambience. 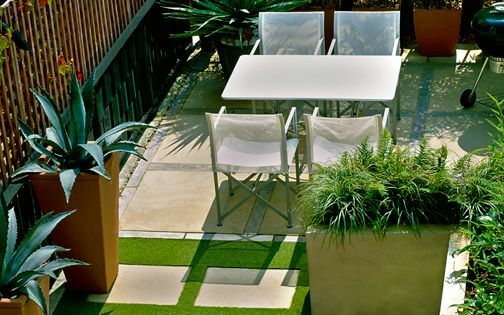 Two contrasting artificial grasses produce diverse colour, height and texture, mimicking the park lawns' distinctive linearity. 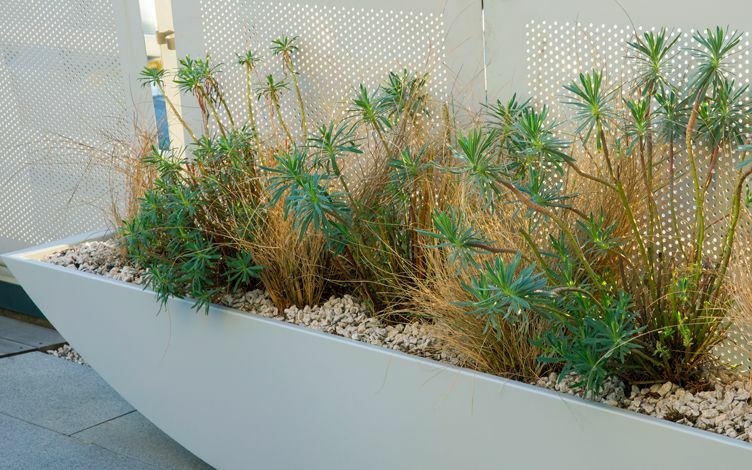 To create an intrinsic link to neighbouring Thames Barrier Park, we introduced similar elements and textures in the roof terrace design, while replicating the building's contours and enhancing functionality. 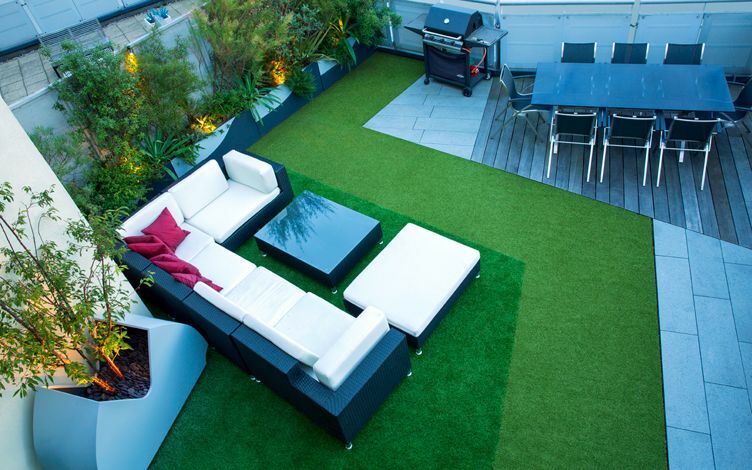 Two artificial grasses define the main lounge, forming a flow into the park's surface, with a granite promenade framing city vistas. 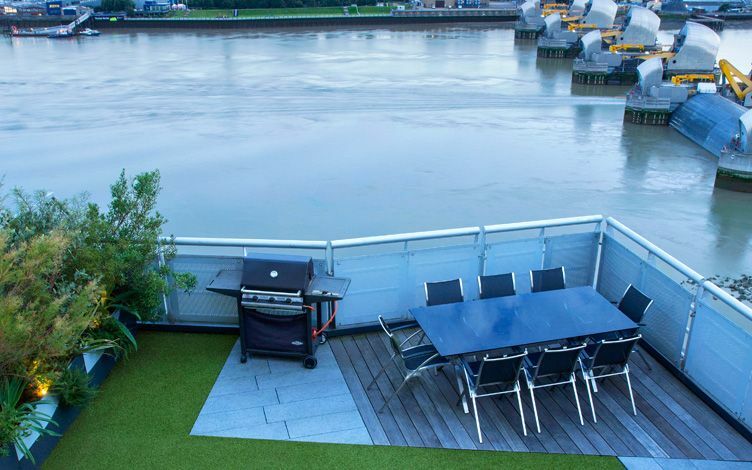 Angular hardwood decking is utilised as a dining vantage point, reminiscent of the river's prominent esplanade, while the Barrier's architecture was echoed with custom-made tree planters. 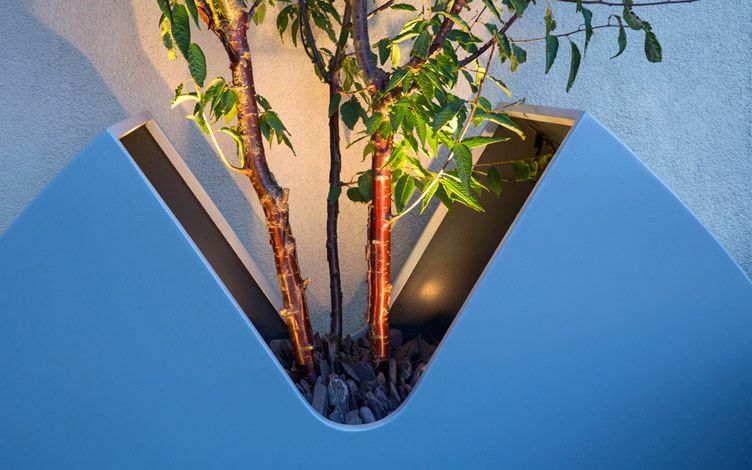 Displaying undulating curves, highlighted by a silvery powder-coated patina, these vessels feature multi-stemmed Tibetan Cherry trees, where scarlet branches produce eye-catching focal points all year round. 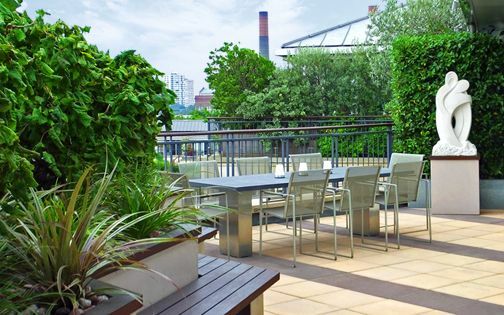 As the roof terrace is simply unreachable by a conventional crane, at a staggering 150-foot-high elevation, construction materials were brought in manually via the building's lift and communal stairways to enable a substantial roof terrace makeover project throughout a 3-week schedule. 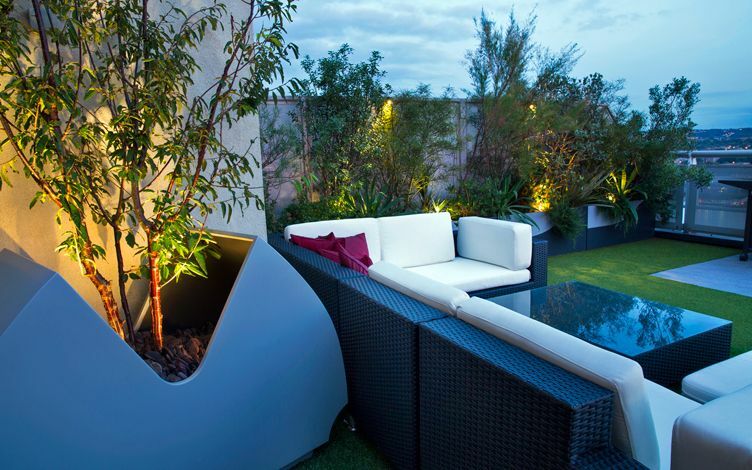 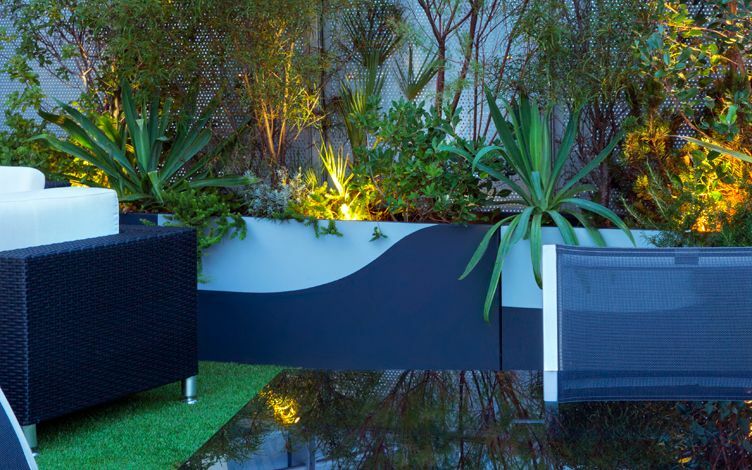 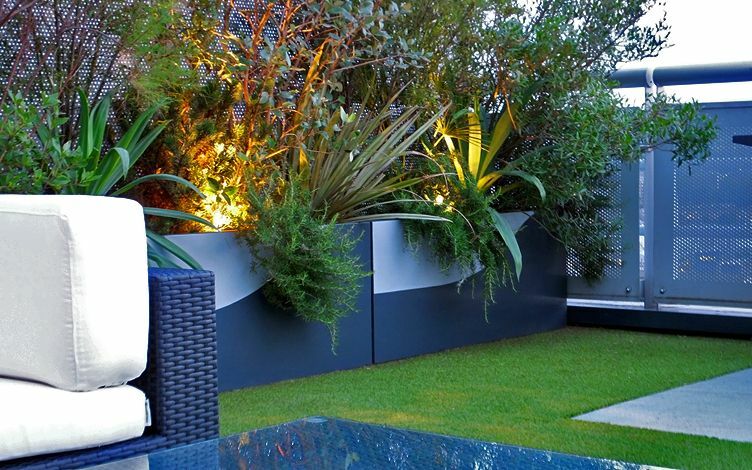 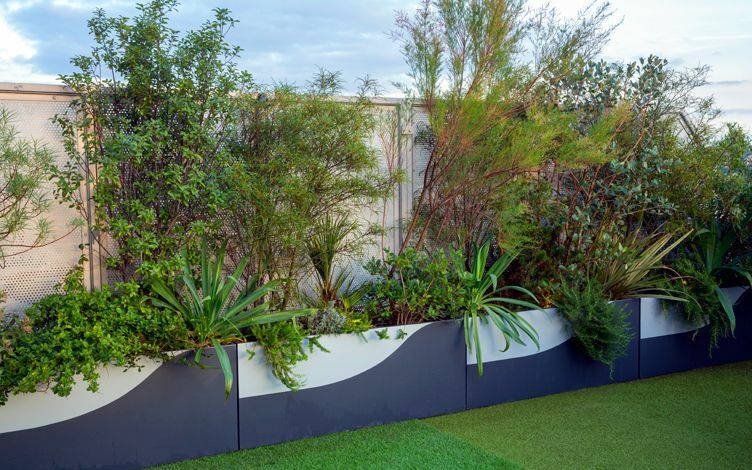 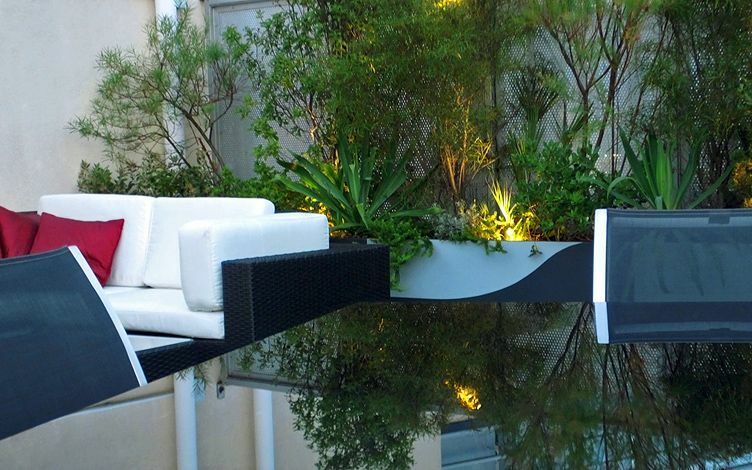 The outlines of specially designed roof terrace planters mimic the Barrier's unique curvature, producing an allegorical water motif, while a series of troughs featuring wind-resistant shrubs display a two-tone pattern – forming a distinct waves' crest motion. 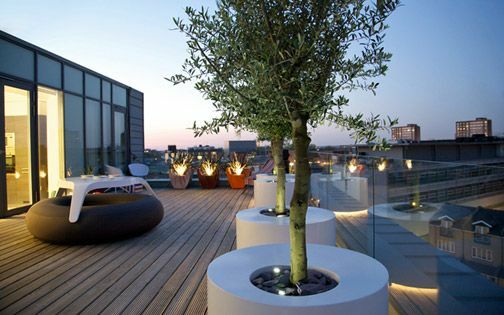 The tree planters on each roof terrace are hued in a light-toned exterior, with deep pewter on their interiors' viewable surface elements. 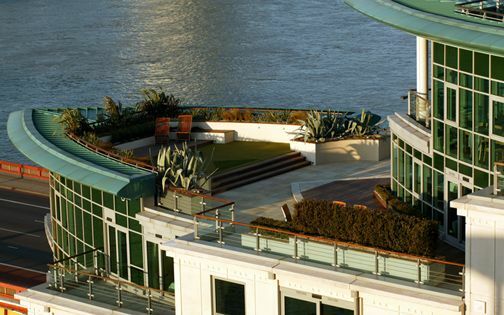 The upper terrace view unveils the rooftop design's asymmetry, tracing the Wharf's inherent angular geometry. 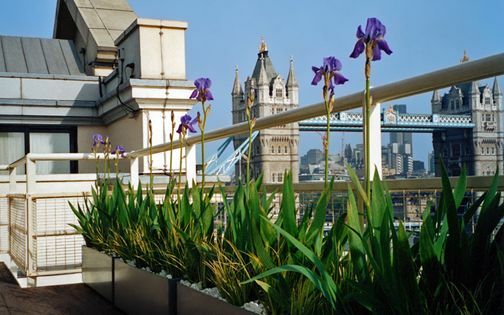 While urban panoramas remain uninterrupted, the left elevation is densely planted with a profusion of Mediterranean rooftop flora, thriving in gusty wind and unremitting river pollution. 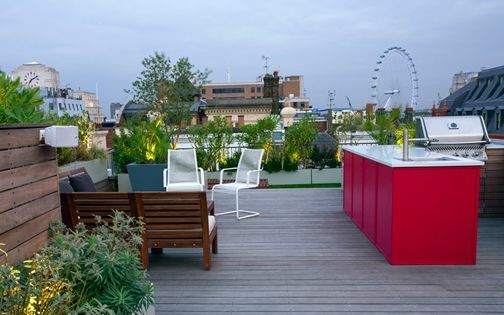 When a scarlet sunset descends across London's terrace skyline in sheer kaleidoscopic fashion, its rejuvenated city landscape provides a majestic backdrop for the seating area. 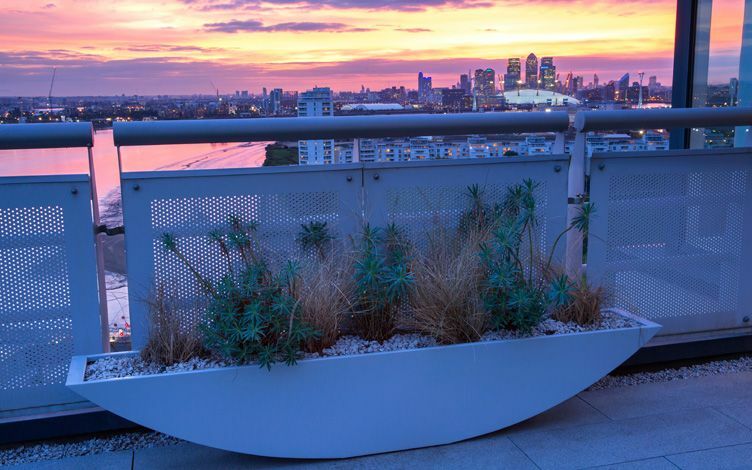 The dome-shaped O2 Arena's roofline is reiterated in the sailboat outline of a slender 2-metre long vase to delineate continuity and site genius loci, amid drifting London cable cars traversing their horizon in dreamlike manner. 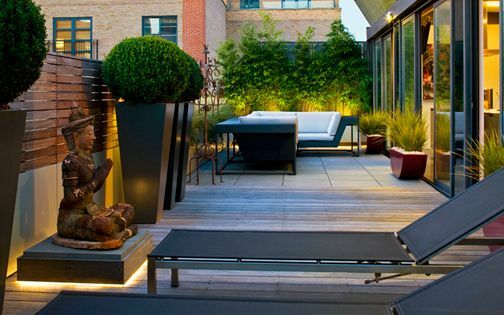 The grass is analogous to the park's sprawling lawns below, alongside granite and hardwood which complete a triad of materials to define this soaring, allegorical terrace landscape. 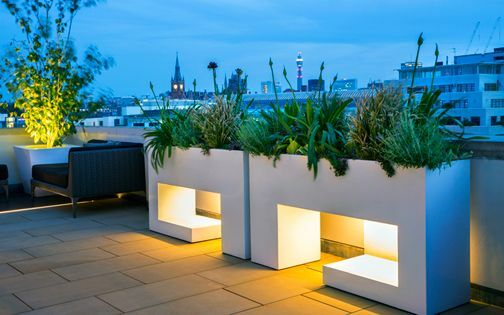 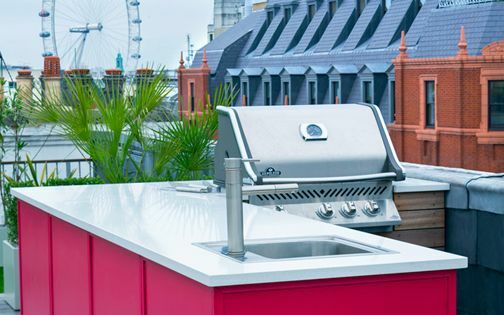 Such a cinematic roof garden panorama has evolved into a staple feature of the capital's architectural aerial arena, where Londoners' hankering for heights sustains a thriving, elevational, and highly immersive urban terrace landscape.